LT1Edit was written by one of the first researchers into the EE platform. This is a dedicated editor written for one platform only, and is not extensible. It provides a built-in flash utility. It has the LEAST amount of parameters available of any EE tuning solution, due to being fairly out of date and being geared towards the beginner. It currently costs $200 and is locked to a single ECM. Although I can’t reccommend purchasing this software package, we must respect his work in being the first one to make this platform tuneable. Tunercat is a package designed to edit bins for a wide variety of platforms, including the LT1. It is extensible and capable. The maintainer of tunercat is a very capable bin hacker, and has discovered many of the parameters now known to the LT1 tuning community. His software is affordable, not restricted to a single ECM, and has a built-in flash utility. Tunerpro is a software package designed for the DIY bin hacker. It does one thing, edits bin files, and it does it very well. Well, I have worked very hard to make a definition file that works well with tunerpro, and here it is. It is heavily documented with comments, and all of the parameters are categorized. It DOES NOT flash ecms, and requires standalone software (see below) to become a complete lt1 tuning solution. My own software. It doesn’t edit bins, since I believe Tunerpro does that best, but it datalogs, analyzes, tweaks, and reprograms your ECM…. and more! From the maker of tunerpro, Winflash is another excellent standalone flash utility. It’s $20, and a 30 day trial is available. My tuning documents will assume you are using tunerpro with my EEX definition file for editing and eehack for logging and flashing. 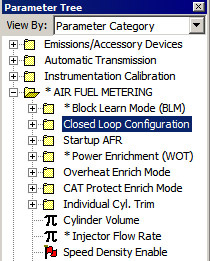 Using Tunercat, some parameters that I discuss may not be available, or will be named differently.